Growing Into A Farm: Before The Walden Effect tells the story of Anna’s search for land, falling in love with her property, struggles to make it into a home, and finding the love of her life. I’m only part-way through it so far, but it’s great learning the backstory to one of my favourite blogs. Low-Cost Sunroom: Heating Your Home With Free Solar Energy was actually written by Anna’s dad, Errol Hess, many years ago. Anna has edited and updated it and released it as an eBook. It details excellent plans for adding an economical sunroom onto the side of your home. The Weekend Homesteader: A Twelve-Month Guide to Self-Sufficiency (paperback or eBook) was published a year ago now, but I had to include it because I got a mention in the acknowledgements section :-). It’s an excellent book full of “weekend-scale” projects like putting up quickhoops, preserving, collecting rainwater, etc. What I really like is how the projects are organised by month, so you can always find stuff that makes sense for the current season (and yes, the appropriate months are also shows for us in the southern hemisphere!). 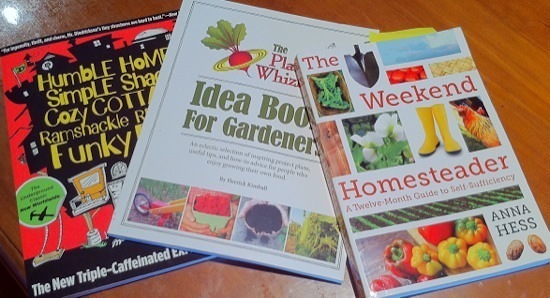 Herrick Kimball’s The Planet Whizbang Idea Book For Gardeners makes a good shelf-mate to The Weekend Homesteader. It’s full of project ideas and tips for gardeners (as you might have picked up from the name!) – I’m currently building the yoke, and will soon put up some trellises using his t-post (star picket) designs. Herrick writes The Deliberate Agrarian blog, another in my must-read list, and has previously published very high-quality plans for building your own apple grinder and cider press, chicken plucker, chicken scalder, and yard cart. The most recent book I purchased was Humble Homes, Simple Shacks, Cozy Cottages, Ramshackle Retreats, Funky Forts: And Whatever the Heck Else We Could Squeeze in Here – yeah, long name! It’s a sketch-style ideas book for building treehouses and cubbies for kids and grownups. Some of the designs are pretty out there, but I’ve gotten a lot of great ideas from it. The author, Deek Diedricksen, also blogs about building cubbies and tinyhouses from recycled and scavenged materials at Relax Shacks. The Greening of Gavin – My First Year of Living Sustainably is about 18 months old now, but is still an excellent read and very relevant for Australians wanting to live more sustainably. Even better, it’s free! The author, my Victorian mate Gavin Webber, blogs at The Greening Of Gavin. I’m planning to use his Build Your Own Backyard Clay Oven book at some stage to build a pizza oven, and Build Your Own Small Solar Power System details the building of a very handy little solar-powered backup power system. Gavin is also a dab hand at cheesemaking, and has written the guide Keep Calm And Make Cheese. Changing Gears is a riveting yarn which follows Greg and Sophie’s incredible bike expedition investigating how we can live a simpler life. Greg interviewed some amazing people through regional Australia he met on the road – from a barefoot monk, to an 18th century woodsman, to a household that lived without any electricity for 20 years. He also interviewed iconic commentators in the sustainability movement – from Clive Hamilton to Costa Georgiadis to Dr Samuel Alexander (UniMelb & co-founder of the Simplicity Institute). Greg’s adventure was a baptism of fire to begin with and a far cry from Greg’s former high powered job in advertising – the furthest he’d travelled on bike was 50km and the longest he’d been in a tent was at the Falls Festival for 3 days! This trip required him to cycle for 9 months (an incredible 6586km), live with his partner 24/7 in a tent for 9 months, have only 2 changes of clothing for 9 months, savour road kill and in Qld cycle the whole day with only a diet of raw food. Do you have any good books (or eBooks) to share? What have you been reading lately? Any suggestions for what I should read next? Hi Darren. Thanks for the list (and the book plug), it will keep me in reading material over the summer! It is a good story with an interesting twist. I think you will enjoy it. @Gavin: Thanks! I’m checking out that book now. I have some friends living in an eco village in New Zealand, so might recommend it to them as well :-).